These Crispy Potato Zucchini Latkes get an interesting flavor boost from parsnip and a little color from carrots. 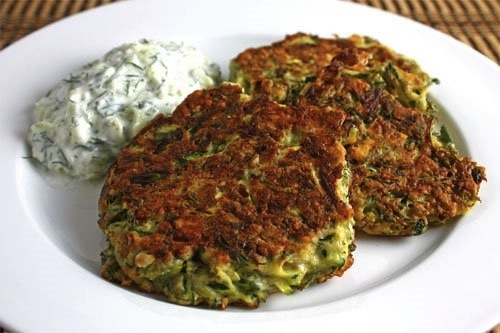 The lacy rounds disappear like magic with or without the Dill Sauce (recipe at the bottom of the page) I usually serve alongside. The rich colors compliment your Sukkos menu, and Chanukah latkes were never so delicious. 1. Prepare a place to drain latkes: line a baking pan with several layers of newspaper and cover with a layer of paper towels. 2. Wrap shredded zucchini in a clean kitchen towel and squeeze to remove as much moisture as possible. In a large mixing bowl, toss together shredded vegetables, flour, dill, green onions, salt and pepper. Stir in eggs and mix well. 3. Heat a large non stick skillet over medium high heat and add enough oil to thinly coat the bottom of the pan. When oil is very hot, drop vegetable mixture by heaping tablespoons into pan. Flatten a little to spread into uniform patties. Cook until brown, about 3 minutes per side. 4. Remove with a small, slotted spatula and drain in prepared pan. Repeat with remaining batter, adding oil to the pan as needed to prevent fritters from sticking. 4. Serve warm with Dill Cream Sauce. QITK tip: (Queen in the kitchen tip): After step 4, you may freeze the fritters. Place in layers in a baking pan, with aluminum foil between layers. Freeze several hours. Remove from freezer, quickly place in a large freezer bag and return to freezer. They will keep about 6 weeks. To reheat: Preheat oven to 400 degrees. Place frozen fritters in one layer on a baking pan in. Bake 5-10 minutes. 1. In a medium bowl, whisk together all ingredients. Refrigerate until ready to use. 2. Refrigerate tightly covered sauce for up to for two weeks. A queen in her kitchen only makes be one potchke recipe per meal. Frying latkes always takes time and tending. With that in mind, I suggest you make this simple Chicken and Wild Rice Pilaf to go with Potato Zucchini Latkes. You can make both recipes ahead of time. It's all you need for an elegant, delicious Chanukkah, Sukkos or Shabbos meal fit for a king.